I've been against the whole concept of "government bailouts" of private businesses from the start. The theory was that we, as consumers, needed the government to prop up failing businesses because they were so vital to our economy. My personal theory has been that we need the free market do the work. If companies made bad investments or bad business decisions, then they should have to live with the consequences. If the companies still have value but are headed toward death, let another company (via the free market) decide that and purchase the company with its own funds. Having the government intervene in all of these bailouts seems to just prolong the pain. The companies receiving money don't seem to be making the kind of drastic changes they need to rehabilitate their businesses. There are just more handouts every time we turn around. 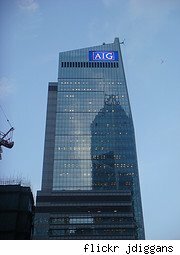 Remember American International Group (AIG)? It got an $85 billion bailout from the federal government because it was too important to go out of business. Well that amount quickly escalated to $123 billion. And now the government has made a deal with AIG to instead give it a bailout worth $150 billion. How is it that in just about a month since the bailout deal with AIG was made, it has almost doubled in cost to taxpayers? There are people saying these bailouts won't really "cost" taxpayers anything, as the government is taking ownership interests in the companies getting bailout funds and will someday see profits. That's supposed to make me feel better? Our government, which is totally inept at running anything like a real business (don't spend more than you make) will own parts of private businesses? I know it may not be popular to mention this, but government ownership of businesses is one part of Communism, something I don't think we want to explore. So now we've got bailouts of AIG, big banks, and probably the Big Three automakers. Who's next for their handout? I think more insurance companies will be next, with credit card companies following closely behind. It's hard not to ask where my bailout is. I've been responsible. I bought a house I could afford, and I make my mortgage payments on time. I've never been late on a credit card payment or charged more than my limit. I pay all bills on time always. Yet I, as a taxpayer, should continue to help fund these bailouts of companies that don't seem to be doing much to fix their problems?? ?